Since the late Renaissance, artists and inventors had been looking for a mechanical method of capturing visual scenes. Previously, using the camera obscura, artists would manually trace what they saw, or use the optical image in the camera as a basis for solving the problems of perspective and parallax, and deciding color values. The main problem was to find some way to record the image in the camera obscura (literally – dark room) to render it permanent. Wedgewood had experimented with paper and leather coated with silver nitrate that formed an image without using a camera. The original negative was painted onto glass. But there was no method of “fixing” the picture, and it had to be kept in a dark room and as it was viewed in low light the picture deteriorated. Eventually sodium hyposuphate – today called sodium thiosulphate was used to wash out the unexposed silver nitrate that had not been reduced to silver. 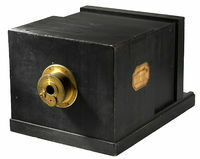 In 1829, Louis J.M Daguerre designed a revolutionary camera about with Niépce a leader in photochemistry, the design of which, had a glass lens at the front of a wooden, light tight box. This design, ( in Europe known as a ‘casette’) translated into most if not all of the later processes in large format cameras until today.